When it comes to food, we’re not very good at austerity in this house. Admittedly, we did fast three times over the Christmas week and twice last week, but that was because we wanted to properly indulge on the other days. However, in this time of post-Christmas austerity many of us will be thinking about tightening both our belts and wallets. But chocoholics, don’t despair. I have a chocolatey treat to offer up to one lucky reader that shouldn’t pile on the pounds and might just help in the battle of the bulge. 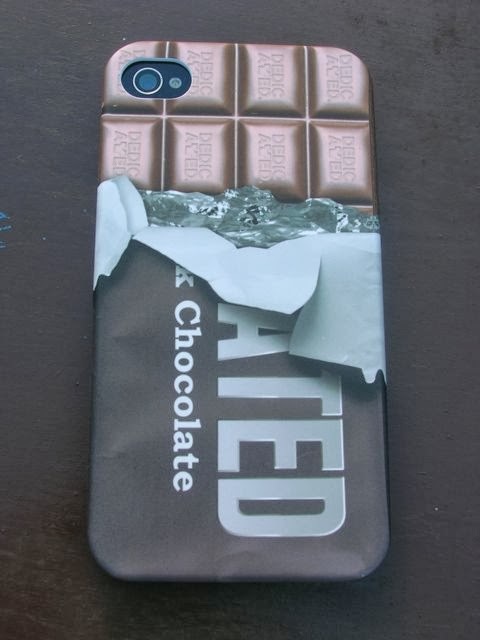 The designers at TShirt Store have come up with an iPhone case in the form of a chocolate bar. A half opened chocolate bar to be precise and as we know, such bars rarely remain that way. This, however, is a feast for the eyes, not the stomach. You can look as much as you like, but you won’t be tempted to eat it. On sale through the TShirt Store, it costs £19. This may seem a tad expensive, but you could soon recoup it by cutting back on your chocolate consumption. Gazing at this tasteful rather than tasty chocolate accessory is probably the way to go. It’s made of tough plastic and is a snug fit. If my experience is anything to go by, it is not likely to fall off, in fact it is remarkably tenacious. I can’t vouch for how long the design will last, but mine has been knocking around for a few weeks now and looks as good as new. I was sent a TShirt Store iPhone case to review. There was no requirement to write a positive review. As always, all opinions are my own. The TShirt Store are kindly offering a second chocolate iPhone case (4, 4S or 5) to give away to one lucky Chocolate Log Blog reader. To be in with a chance of winning, please fill in the Gleam widget below. You will need to leave a comment on this post which then gives you additional chances to enter if you so wish. Gleam will pick a winner at random from the entries received. If you are commenting anonymously, please give me some way of identifying you as I will be verifying the validity of entries. Any automated entries will be disqualified. This giveaway is only open to those with a UK postal address. The winner will need to respond within 7 days of being contacted. Failure to do this will result in another winner being picked. Prizes are offered and provided by TShirt Store and Chocolate Log Blog accepts no responsibility for the acts or defaults of said third party. Kit kat would be fab but I love the one shown. I like the design shown! I love the prize design, would be tempted to bite into it though !! I would like to have a malteasers design. Corn on the cob ! with a big dollop of butter. I’m a Samsung user, but my dear friend and co-worker has an iPhone and she is a *major* chocoholic, so I’m entering this and if I win, I’ll surprise her with the case. She’s introduced me to Hotel Chocolat and Paul A. Young chocolates and … oh my, I’m getting hungry just thinking about it! Great give-away! The temptation to eat chocolate, seeing this everyday, might be stronger but I think its worth the risk!! My daughter in law would love this for her new ipone. FLAKE. MMM, I WONDER IF THERES ONE IN THE CUPBOARD? the lips one although the cassette one is pretty good too. I’d have a melted dark chocolate design swirled over my phone! Any chocolate would be fab by me! yorkie bar theyre not just for men! I just heard the word chocolate mentioned and enough said!! Too too many but anything Cadbury’s is a winner! ummmm looks good enough to eat lol!! This is just my idea of choc heaven and so cool too. Id want to eat my phone! I love the case and have the perfect recipient in mind. Responsible for more broken teeth than all the Jerry Springer episodes put together.